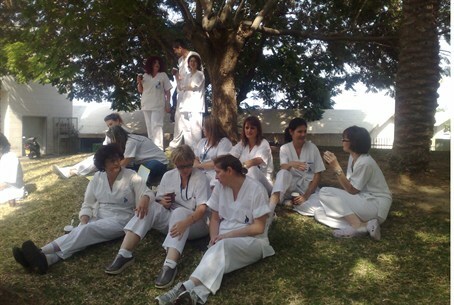 MainAll NewsInside IsraelNurses Back to Work, But Can State Afford Them? Nurses Back to Work, But Can State Afford Them? Israel's nurses were back at work Thursday morning, after a lengthy strike by nurses was settled with a new work agreement. Israel's nurses were back at work Thursday morning, after a lengthy strike by nurses was settled with a new work agreement. The agreement gives nurses a 13% increase in their salaries over the next four years. The increases are spread out over that period, and when added up, the nurses will have received raises of between NIS 1,100 and NIS 1,600 ($300 to $450). Over 9,000 operations were canceled during the 17 days that nurses walked off the job, because of the lack of personnel in hospitals. The Health Ministry said that the state had lost many millions of shekels in extra days of hospitalization for patients and temporary care expenses for patients who needed operations, but could not have them done. While Treasury officials expressed relief that the strike was over, officials also pondered where the money to pay for the raises would come from. In recent months, the International Monetary Fund has signaled to Israel that it was losing patience with the government's apparent inability to cut public spending, and the state budget that is likely to be presented after the elections is set to contain a large number of budget cuts.